A team of scientists including researchers at the U.S. Department of Energy's (DOE) Brookhaven National Laboratory and SLAC National Accelerator Laboratory have identified the causes of degradation in a cathode material for lithium-ion batteries, as well as possible remedies. Their findings, published on Mar. 7 in Advanced Functional Materials, could lead to the development of more affordable and better performing batteries for electric vehicles. For electric vehicles to deliver the same reliability as gas vehicles they need lightweight yet powerful batteries. Lithium-ion batteries are the most common type of battery found in electric vehicles today, but their high cost and limited lifetimes are limitations to the widespread deployment of electric vehicles. To overcome these challenges, scientists at many of DOE's national labs are researching ways to improve the traditional lithium-ion battery. Batteries are composed of an anode, a cathode, and an electrolyte, but many scientists consider the cathode to be the most pressing challenge. Researchers at Brookhaven are part of a DOE-sponsored consortium called Battery500, a group that is working to triple the energy density of the batteries that power today's electric vehicles. One of their goals is to optimize a class of cathode materials called nickel-rich layered materials. "Layered materials are very attractive because they are relatively easy to synthesize, but also because they have high capacity and energy density," said Brookhaven chemist Enyuan Hu, an author of the paper. Lithium cobalt oxide is a layered material that has been used as the cathode for lithium-ion batteries for many years. Despite its successful application in small energy storage systems such as portable electronics, cobalt's cost and toxicity are barriers for the material's use in larger systems. Now, researchers are investigating how to replace cobalt with safer and more affordable elements without compromising the material's performance. "We chose a nickel-rich layered material because nickel is less expensive and toxic than cobalt," Hu said. "However, the problem is that nickel-rich layered materials start to degrade after multiple charge-discharge cycles in a battery. Our goal is to pinpoint the cause of this degradation and provide possible solutions." Cathode materials can degrade in several ways. For nickel-rich materials, the problem is mainly capacity fading--a reduction in the battery's charge-discharge capacity after use. To fully understand this process in their nickel-rich layered materials, the scientists needed to use multiple research techniques to assess the material from different angles. "This is a very complex material. Its properties can change at different length scales during cycling," Hu said. "We needed to understand how the material's structure changed during the charge-discharge process both physically--on the atomic scale up--and chemically, which involved multiple elements: nickel, cobalt, manganese, oxygen, and lithium." To do so, Hu and his colleagues characterized the material at multiple research facilities, including two synchrotron light sources--the National Synchrotron Light Source II (NSLS-II) at Brookhaven and the Stanford Synchrotron Radiation Lightsource (SSRL) at SLAC. Both are DOE Office of Science User Facilities. "At every length scale in this material, from angstroms to nanometers and to micrometers, something is happening during the battery's charge-discharge process," said co-author Eli Stavitski, beamline scientist at NSLS-II's Inner Shell Spectroscopy (ISS) beamline. "We used a technique called x-ray absorption spectroscopy (XAS) here at ISS to reveal an atomic picture of the environment around the active metal ions in the material." "These experiments produced a huge amount of data, which is where our computing contribution came in," said co-author Yijin Liu, a SLAC staff scientist. "It wouldn't have been practical for humans to analyze all of this data, so we developed a machine learning approach that searched through the data and made judgments on which locations were problematic. This told us where to look and guided our analysis." 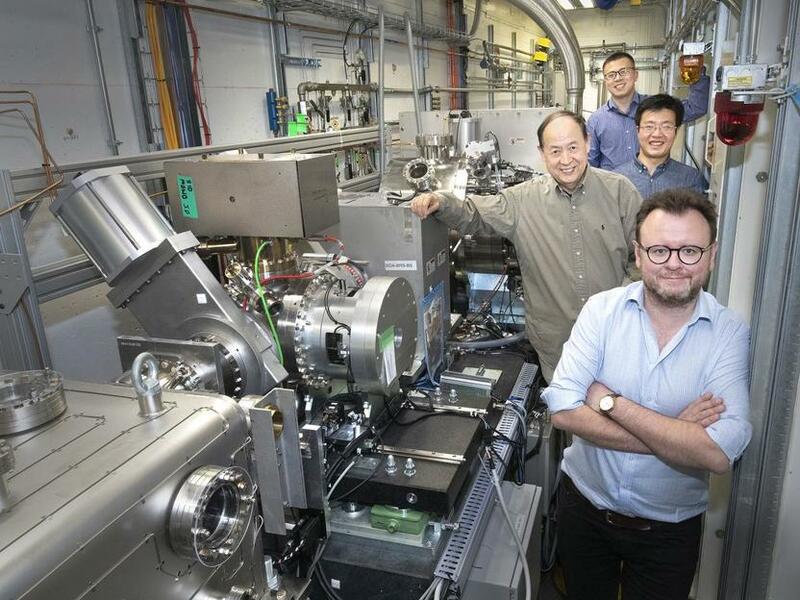 Hu said, "The major conclusion we drew from this experiment was that there were considerable inhomogeneities in the oxidation states of the nickel atoms throughout the particle. Some nickel within the particle maintained an oxidized state, and likely deactivated, while the nickel on the surface was irreversibly reduced, decreasing its efficiency." "During a battery's charge-discharge process, the cathode material expands and shrinks, creating stress," Hu said. "If that stress can be released quickly then it does not cause a problem but, if it cannot be efficiently released, then cracks can occur." "We work in a development cycle," Stavitski said. "You develop the material, then you characterize it to gain insight on its performance. Then you go back to a synthetic chemist to develop an advanced material structure, and then you characterize that again. It's a pathway to continuous improvement." Additionally, as NSLS-II continues to build up its capabilities, the scientists plan to complete more advanced TXM experiments on these kinds of materials, taking advantage of NSLS-II's ultrabright light.